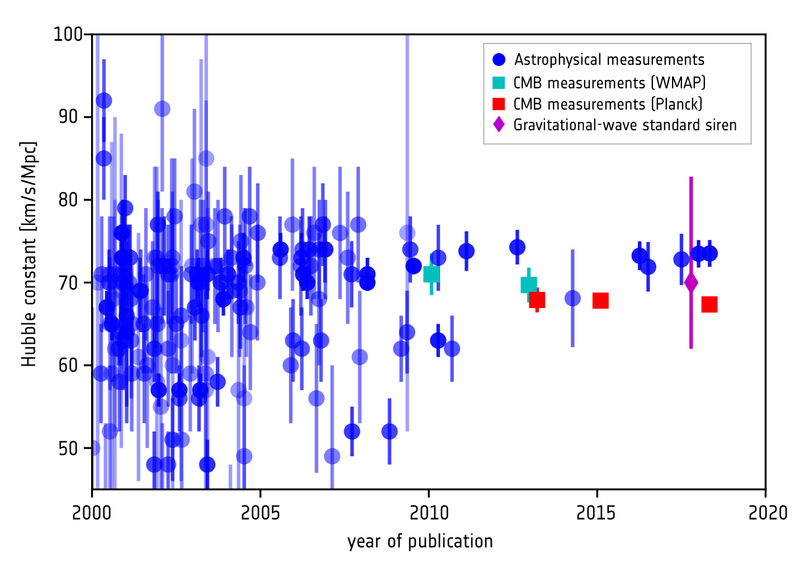 The evolution of measurements of the rate of the Universe's expansion, given by the so-called Hubble Constant, over the past two decades. The slightly esoteric units give the velocity of the expansion in km/s for every million parsecs (Mpc) of separation in space, where a parsec is equivalent to 3.26 light-years. The figure astronomers derive for the Hubble Constant using a wide variety of cutting-edge observations to gauge distances across the cosmos is 73.5 km/s/Mpc, with an uncertainty of only two percent. These measurements are shown in blue. Alternatively, the Hubble Constant can also be estimated from the cosmological model that fits observations of the cosmic microwave background, which represents the very young Universe, and calculate a prediction for what the Hubble Constant should be today. Measurements based on this method using data from NASA's WMAP satellite are shown in green, and those obtained using data from ESA's Planck mission are shown in red. On the one hand, it is extraordinary that two such radically different ways of deriving the Hubble constant – one using the local, mature Universe, and one based on the distant, infant Universe – are so close to each other. On the other hand, in principle these two figures should agree to within their respective uncertainties, causing what cosmologists call a 'tension' – an oddity that still needs explaining.